Self-sufficient off-grid energy supply with a solar island battery. How to become (electric) grid independent – and what is needed for a proper off-grid power supply? We define self-sufficient energy supply as independence from the electricity grid. For an off-grid power supply power generation – usually achieved in the field of alternative energies by photovoltaics – is required. In that case one speaks of a PV island system or solar island solution or island system. Of course, the power can also be generated elsewhere, e.g. by small wind turbines or diesel generators. Furthermore, you need an internal power grid, which connects the power generator with the consumers by means of wiring. The heart of the self-sufficient energy supply, is the combination of electricity storage, inverter and energy management system. The inverter ensures that different voltage and current frequencies between the generator and the power consumer get standardized. The power storage device offers buffer function. An over / under-coverage is compensated and one can hold power reserves for emergencies. 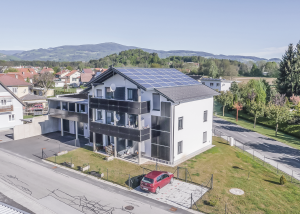 On the one hand, when during the day strong sunlight generates a lot of energy from the photovoltaic, which can then be used in the evening or at night. On the other hand, to ensure that, if the case arises, power generation fails, it is possible to supply defined critical consumers in the electricity storage facility with defined buffers. In that way it can be ensured that the alarm system stays constantly supplied with power, even if the generators do not supply any energy for a certain period of time. The third part of the centerpiece is an intelligent energy management system or EMS. EMS is the brain of self-sufficient power supply. It controls when power should be saved and when power should be delivered. Even figures about directly consumed energy and stored surplus power in the battery are given. When the power storage is full and there is no consumption, the power is cut off to ensure balancing within the solar island system. EMS integrates several potential generators, and recognizes when alternate sources are about to start operating in conjunction with the state of charge of the power storage. 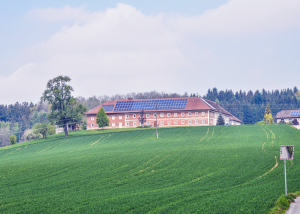 As an example: Due to bad weather periods the photovoltaic provides little power, the power storage is loaded with 20%. If the 20% mark of the power storage is undershot, then EMS controls the integrated diesel generator and replenishes the current storage to 50%. Weather data is included in the analysis of the EMS. E.g. the weather forecast predicts bad weather for tomorrow (dense cloud cover), this information is picked up by the EMS and it regulates unimportant consumers or controls alternative producers on time. A self-sufficient energy supply sounds complicated at first glance, but it does not have to be. With the GREENROCK Expert product line, power storage units, inverters and EMS are delivered as an integrated Plug & Play complete system. Various producers and consumers can be integrated via open interfaces. Certified installation partners can quickly, effectively and without unnecessary sources of error expand existing photovoltaic system to a solar island system. 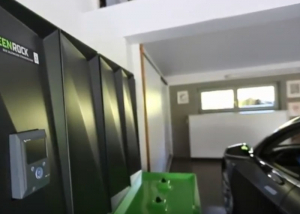 The GREENROCK power storage is based on saltwater power storage technology and is the safest and most environmentally-friendly electricity storage. Thanks to this technology, it is possible to empty the power storage device 100% without damaging the power storage. Comparable technologies can only be emptied to a limited extent (lead batteries up to 50% of the storage capacity, lithium-ion storage up to 80%) without being permanently damaged. Especially in the course of solar island applications, it is important to have available the full power storage capacity. As in case of an emergency, no external power grid can be accessed. GREENROCK is 100% maintenance-free and always ready for use. A self-sufficient power supply is provided by the robust and always ready to use GREENROCK power storage. It secures your home. GREENROCK is made of natural materials. There is no limit regarding transport, storage or operation of the battery. Full flexibility. As a connectable overall system, installation is quick and easy. Low self-discharge helps to effectively operate your PV island system. In order to be able to calculate a PV stand-alone system, it is necessary to know the power consumption and its distribution during the day / night and taking into account seasonal fluctuations (heating, air conditioning systems). This information builds the basis for calculating a PV island system. Based on the data of consumption the desired power generation can be defined. E.g. Photovoltaic, small wind power, diesel generator or combination of several producers. The consumption data together with the defined producers form the basis of calculation for dimensioning generators and electricity storage. These are the rough steps regarding calculation of a solar island system, our specialists and partners will gladly help you with a concrete elaboration.